Wunderlist, the slick, cross-platform to-do list service from Berlin’s 6Wunderkinder, has reached the significant milestone of 1 million active users. 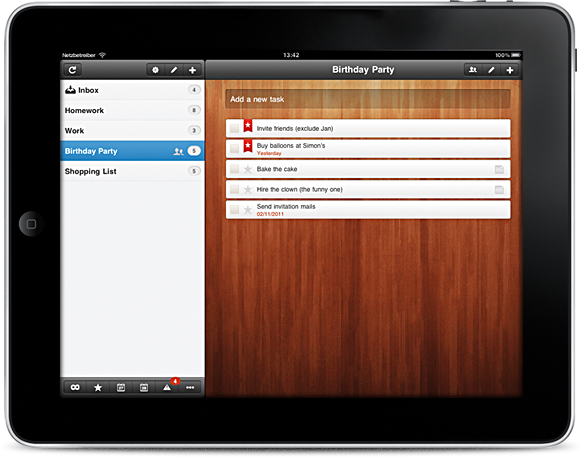 Wunderlist is available for iOS, Android, Mac, Windows and the Web, with users’s tasks being synced between devices. Of the 1 million users accrued since the first app launched in November last year, 57% are in the USA, with Germany and the UK taking second and third place with 16% and 13% respectively. 6Wunderkinder says that there have been 30 million tasks created; 350 million synchronisations and 3.7 million task lists assembled in the Wunderlist’s first 275 days. Its busiest day yet was 20 June, when 270,000 tasks were created. The app was named as one of our top productivity apps of 2010 and stands out as being a lot easier on the eye than much of the competition in the market. 6Wunderkinder is part of a thriving startup culture in Berlin, and it is currently working on its next product, Wunderkit, which it hopes will become an industry-standard productivity platform, allowing “effective and seamless collaboration.” Wunderkit is due for release in late 2011.